316 pages | 121 B/W Illus. Whilst sustainability is already an important driver in the new building sector, this book explores how those involved in refurbishment of commercial building are moving this agenda forward. 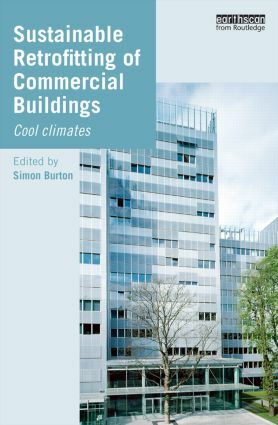 It includes chapters by developers, surveyors, cost consultants, architects, building physicists and other players, on the role they each can play in enabling refurbishment to be commercially, environmentally and socially sustainable. Case studies from northern climates show real examples of different building types, ages and uses and will demonstrate what action has been taken to create more sustainable buildings. The chapters raise and discuss all the relevant issues that need to be considered in retrofitting decision making. Changing standards, planning, process management, financing, technical issues, site organisation, commissioning and subsequent building management are all considered. The book demonstrates that buildings can be made comfortable to occupy, easy to manage and low in energy demand and environmental impact. Simon Burton has worked in the field of energy conservation in buildings and urban areas for more than 20 years. He was a Director of ECD Energy and Environment and subsequently a Regional Director with AECOM in London. He has been responsible for several UK Government research projects.